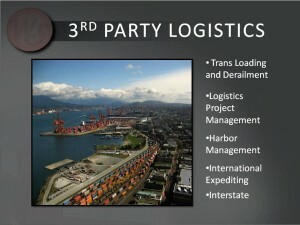 Third party logistics is sometimes referred to as ‘3PL’. The simplest definition of a 3PL is a company that works with shippers to manage their logistics operations. Logistics can include elements of warehousing, transportation management software, freight rate negotiation, in-depth reporting, forecasting, freight bill auditing and much more. There are literally thousands of 3PLs in the market that have different models and perform different tasks. Some 3PLs will specialize in certain industries, frozen food for example. Others might specialize in one specific area of logistics such as auditing freight bills, warehousing or providing logistics related software. We consider ourselves a full-service 3PL. A standard full-service 3PL will provide services across multiple industries. Those services will include auditing freight bills, reducing freight rates, reporting and technology in the form of a Transportation Management System (TMS). A true 3PL will bring you these same services but leave the decision making up to you. A standard 3PL will bring best practices but make their own decisions of how to manage your logistics function. Weststar is an integrated logistics and transportation company for the Oil & Gas Industry. Weststar provides trucking and crane service to all Oil & Gas field operations. Weststar also specializes in yard and inventory management, logistics for project management, and customized trailers to facilitate a safe and cost effective strategy for transportation.